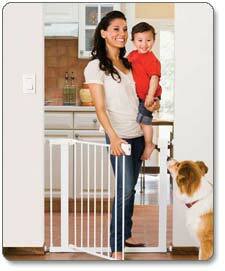 The Carlson Mini Tuffy is an amazingly versatile expandable pet gate with patented small pet door. This all-metal expandable is the first of it’s kind. Expanding 26-42-inch wide and stands a convenient 18-inch tall. The metal frame is strong, sturdy, and durable making this gate extra secure and superior to plastic. Super easy to install, takes literally seconds. Pressure mounts and locks with the patented Easy Fit Locking System. Soft rubber bumpers are gentle on walls and keeps them scuff free. The lightweight compact design is great for travel and storage. Slate size is 1.75-inch wide. KidCo Spindle 2 Pack For homes that don’t have staircases bordered by walls, the KidCo Y Spindle helps to mount gates. The Y Spindle wraps around the baluster to help provide a secure installation. Spindle helps pressure mounted gates latch onto freestanding staircases. The KidCo Y Spindle comes in packs of 2. Munchkin Munchkin Gate Extension, White, 5.5"
Regalo Extension for Extra Tall Easy Step Gate, White, 4"
Regalo Extension for Safety Gate, White, 12"
North States Diamond Mesh Gate will easily and effectively keep your kids inside while at the same time, complements your home decor. The gate is pressure mounted and can easily be locked in position. It locks with absolutely no measuring required. Ideal for bottom of stairs and between rooms. Made in the USA with a sturdy hardwood frame, the North States Gate Diamond Mesh Gate is designed with rigid mesh panels with no mar rubber bumpers, giving you absolutely peace of mind. Fits openings 26.5″ through 42″ wide. Gate is 23″ high. Please note that pressure mounted gates may seem defective in first glance, but they will work fine if they are installed correctly as per the printed instructions. 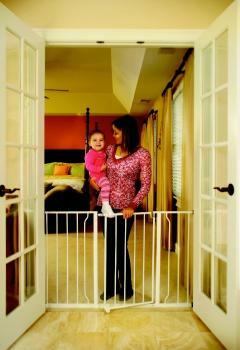 The position and lock gate helps parents keep their children safe from common household dangers. Not only is this classic pressure mount gate easy to install, it also helps prevent damage to your home because no hardware is required. Also, the locking bar is marked and notched for easy installation and re installation. Finally, the sturdy wood frame and plastic mesh are durable and secure leaving you with a feeling of assurance that your child is away from harm. 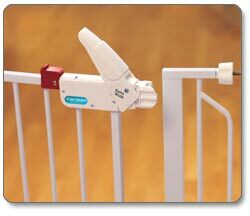 The Easy Open Extra Wide Safety Gate boasts 100 percent steel construction for durability and strength, providing security you can rely on for those moments when you can’t be within arm’s reach of your child. It installs quick, requiring no tools with four pressure mounts that are each individually adjustable to provide a stable and secure fit. This gate is PVC free and has been certified by the Juvenile Products Manufacturers Association (JPMA). It also meets the safety standards set by the American Society for Testing and Materials (ASTM). This safety gate is 31 inches tall and can fit openings between 29-1/2 to 52 inches wide. It includes a 6-inch and 12-inch extension kit for added versatility. For additional security use the included wall cups. 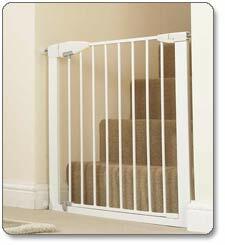 This sturdy gate is ideal for doorway, hallway and extra wide openings. Additional extensions are sold separately. The gate’s convenient design allows adults to walk through by simply pulling back on the lever-style handle. It offers a one touch release. 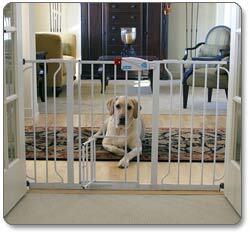 The gate also works great to contain pets to one part of the home. As easy as it is to install, it’s even easier to take down thanks to its pressure-mounted system. The gate’s lightweight, portable frame stows flat making it easy to store in a closet or even take with you on your next trip. 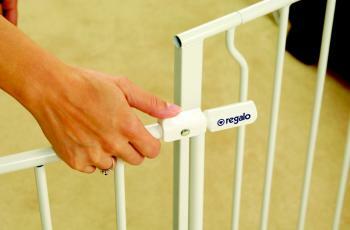 The Regalo Easy Open Extra Wide Safety Gate is backed by a manufacturer’s limited 90-day warranty. Included in the packaging is one Regalo Easy Open Extra Wide Safety Gate, instruction manual, one 6-inch extension kit, one 12-inch extension kit and four pressure mounted spindle rods with four wall cups. Regalo is an industry leader in products that make life a little less hectic for busy parents and exceptionally safe for little ones. They strive to produce the highest qualitiy and most innovative product lines that include the HideAway Bedrail, My Cot Portable Travel Bed, Easy Diner Portable High Chair and much more. Regalo’s products are certified by the American Society for Testing and Materials. Over the years, parents, grandparents and caregivers have come to know and depend on Regalo products for at the home and on the go.